Thymic cysts are rare embryonic remnants along the course of thymic migration in the neck or the anterior mediastinum which may result in cervical masses in children, often misdiagnosed. We present the experience gained by three European tertiary care medical centers in the treatment of thymic cysts as well as the current data on the embryology, clinical presentation, diagnosis and management of thymic cysts. 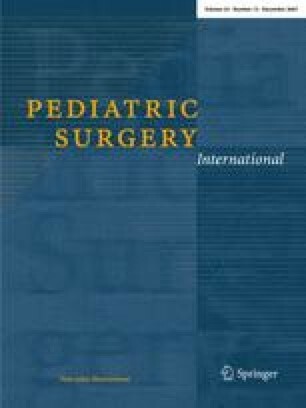 A retrospective study was carried out in nine patients with thymic cysts during the period 1986–2002 at the departments of Pediatric Surgery of Children’s University Hospital “Federico II” and “Santobono” Pediatric Hospital of Naples in Italy and “Aghia Sophia” Children’s Hospital of Athens in Greece. All cases were asymptomatic, appearing mainly as masses resembling branchial cyst or lymphatic malformation. Laboratory and imaging investigations were not useful for preoperative diagnosis. In one case the mass extended into the mediastinum. The histological findings of thymic tissue and Hassal’s corpuscles in the cystic wall were diagnostic. In all cases, surgery was successful and uneventful. Surgical excision was accomplished by dissection of the cystic masses from the jugular vein, carotid artery and vagus nerve and from the sternocleidomastoid muscle. The presence of a normal thymus in the mediastinum must be documented preoperatively in order to avoid the risk of total thymectomy. If a cervical thymic cyst extends into the normal thymus, attempts should be made to preserve the thymus, especially in younger patients. Thymic cysts should always be included in the differential diagnosis of lateral cervical masses, especially in children. Bruno Cigliano and Nikolaos Baltogiannis contributed equally to the work.